Consider Travertine & Slate Too! A limestone counter top is velvety-smooth, like soapstone and shares a color palette similar to travertine only with less pattern variation and neat surprises! Quality of limestone can vary affecting durability and maintenance, so choosing wisely is paramount. Sleek and exotic darker colors make limestone a good match for modern or urban designs, yet lighter earthy tones of white, beige, gold and pink limestone create a calm and comfortable feeling that suits traditional, old-world or French country kitchen design ideas. 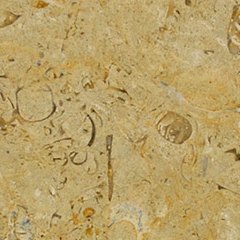 A unique characteristic of this natural stone that distinguishes it from close cousins travertine and marble is the fossils and seashells often found embedded in the surface adding a surprising and fascinating visual element to the countertop. Quality of limestone can vary greatly. Some limestones are dense and hard and can be polished to a shine. Most often though you'll see honed limestone. Other limestones are soft and can degrade or crumble rather easily. These softer varieties are also very porous, highly-absorbent (far more so than marble or granite) and will readily stain from spills of oils, foods and beverages. In truth, most of these "compact" limestones are sold as marble. Marble, travertine and limestone are all in the same family. Limestone is transformed into marble by high heat and pressure over millions of years. So, these two sister stones are different but similar enough that there can be some cross-over when naming in stone warehouses. Also, limestone is composed almost entirely of calcium carbonate and will quickly etch (dull, light-colored spots) upon contact with acidic foods/drinks (even mild acids) and harsh cleaners. 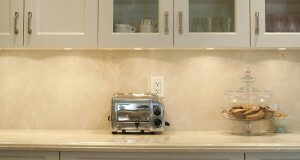 To maintain a limestone counter top it is best to treat it as you would travertine and marble by using coasters, cutting boards and avoiding exposure to acidic foods, drinks and chemicals that will etch the surface leaving those dull and discolored spots, glass-rings and "water" marks. Be sure to use only products safe for limestone cleaning as we recommend. If water testing reveals that application of a sealer would be beneficial, then we suggest using one of these top impregnating or color-enhancing sealers. Since most varieties you'll encounter are of the more coarse and porous type, it is almost certain that a limestone sealer will be necessary to help prevent stains, but testing is the proper procedure vs. just blindly applying a stone sealer. Installation location is a key. Limestone can make a beautiful and unique countertop, although you really need to choose a very dense variety if installing it in the kitchen. Even then, it isn't a great choice for a kitchen countertop due to the issue of etching. Etching is impossible to prevent in the kitchen and sealing does not stop etching. Ideal uses of limestone are for bathroom countertops and furniture tops, but it is truly excellent as floor tile anywhere in the home (similar to uses for slate tile). It's perfect for installation around the tub and in the shower where limestone flooring provides secure footing. Texas white limestone is a particular variety popular for use as an exterior wall cladding adding a rustic elegance to your home. And Indiana limestone has been quarried and installed in commercial and residential projects since the 1800s.